MSNBC's Steve Kornacki will leave his weekend gig and join Chuck Todd's "MTP Daily" as the Monday host. The announcement Monday was the latest addition to the channel's rapidly shifting weekday news lineup. Kornacki's weekend time slot will be replaced by a new show hosted by Alex Wagner, an MSNBC spokesperson confirmed. Wagner's weekday show was canceled over the summer amid a series of programming changes. 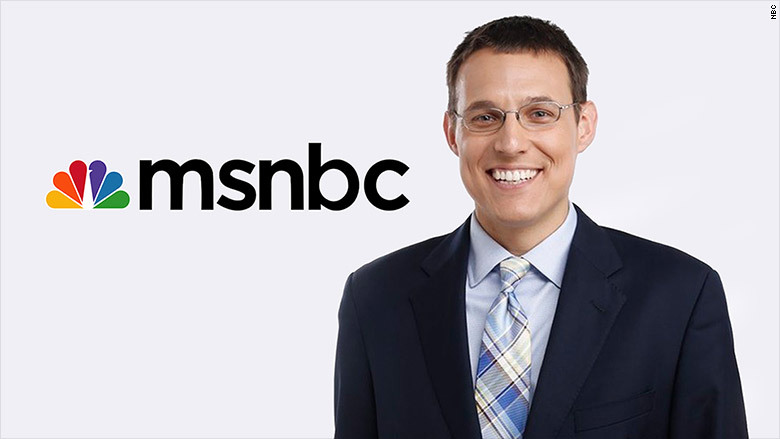 Kornacki will host "MTP Daily" on Mondays, allowing Todd to take a day off between his Sunday morning duties on NBC's "Meet The Press" and weekday duties on the new daily iteration of the show. Kornacki will continue to fill-in for Chris Matthews on "Hardball" and appear across MSNBC programs throughout the week. The changes are part of MSNBC's effort to shed its reputation as a liberal platform and rebrand as a nonpartisan news channel -- at least in daytime. MSNBC has already shaken up its entire daytime lineup, brought in new news anchors, and is using former Nightly News host Brian Williams to anchor breaking news coverage. In an interview with Variety on Monday, NBC News Chief Andy Lack said it was still "early days" for the MSNBC revamp, and promised that more changes were coming. "We have got a lot of parts and pieces we have got to fit into this puzzle," he said. Lack suggested that he may expand "Morning Joe," the weekday morning show, beyond its current three hours. "It's on at 6 to 9 a.m. in the Eastern Time zone. It isn't really seen as much in Los Angeles as we'd like it to be -- in Los Angeles, where it's 3 a.m., or San Francisco or Seattle," Lack told Variety. "I'm just looking at ways to extend some of the good work that Joe and Mika are doing and turn it around, expand it." "In my view, it is the most influential program in cable news in the morning, and I think it's missing an opportunity in the West," he said. Kornacki, a senior political writer for Salon.com, previously served as a co-host of MSNBC's now-defunct weekday program "The Cycle." He moved to "Up" in 2013 after its former host, Chris Hayes, was given a weeknight primetime show.